Recent SNP testing has provided a close collateral line to Benjamin Cooley (c1615-1684) of Springfield, Massachusetts and born in Tring, England. There's a good chance that this and other Tring testers, along with Tring public records, will allow researchers to determine the extended family into which Benjamin was born. Other than that, the shared SNP nodes among the other groups are quite ancient. It will be incumbent on other group members to SNP-test in order to find later relationships, such as is now occurring with CF02. One day, it will likely be possible that a Cooley can order a 12-marker STR followed by a handful of SNPs and discover their place on the tree, even — in some cases, once enough data has been acquired — down to their immigrant ancestor. In the meantime, there's still a need for some serious testing. 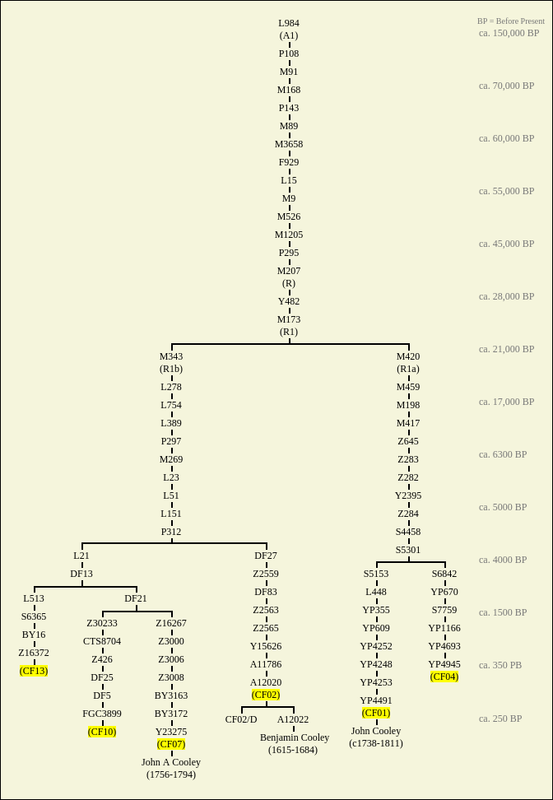 The Big Y remains best for new territory among STR-only groups, preferably through two testers having a genealogically-proven MRCA (Most Recent Common Ancestor). This allows us to identify a specific genetic fingerprint for the ancestor that can be used as a sort of measuring stick by which a degree of relationship can be established among other group members. Once that's been sorted out, SNP panels can be created, such as the R1b-A11786 CF02 Cooley Segregation Panel at yseq.net — that very thing that allowed us to find the Benjamin Cooley collateral line. If you have such a test in the works, please let me know so that I can keep an eye on it. Also contact me should you wish to discuss testing options. I'd love to see the day that all Cooley groups benefit from the new technology.